Gelatin, which is usually sold as a powder, is derived from animal collagen. It has the property of turning liquids into wobbly semi-solids. While it contributes to a dish's structure, it has no flavor or smell. Here are a few tips about working with gelatin: one packet of the powder will handle two cups of liquid. One packet of powder equals roughly one tablespoon. Gelatin powder needs to be hydrated before using. This called "blooming" the gelatin. Select a smallish sauce pan at least 5 inches wide. Pour in about 1/3" of cold water. Sprinkle the powder onto the water evenly and let it sit for about five minutes. Do not pour the powder in one big mound, the inner particles will not properly hydrate. After five minutes, stir the gelatin into the water to get it to dissolve. You may want to heat it very gently by placing the container into a bowl of hot water and working the gelatin with a small whisk. When it is properly hydrated, the gelatin will be completely dissolved and you will have a clear, slightly tan liquid. 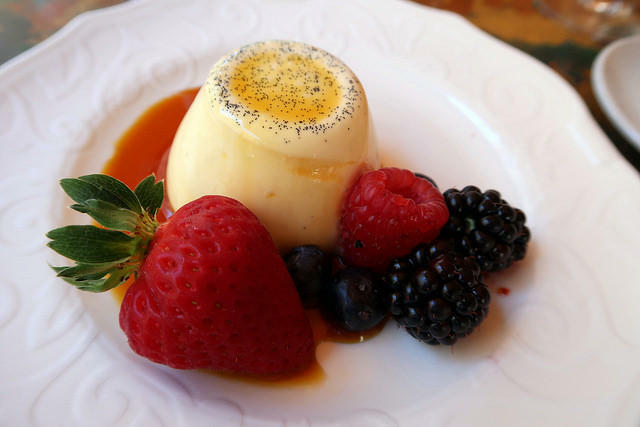 Panna cotta means "cooked cream" and by this we mean 2 parts heavy cream to one part half and half. If you use milk, the results will not be as good. So to get started, in a sauce pan combine 1 1/3 cups heavy cream, and 2/3 cup half and half with one heaping tablespoon of sugar and 2 teaspoons of vanilla extract. Bring this mixture to a near boil, stirring constantly. Just as it starts to boil, remove it from the heat. Stir in a few tablespoons of the hot cream into the gelatin mixture, making a slurry. Use a small whisk to get the gelatin as much dissolved as possible. Add the gelatin slurry to the sauce pan and whisk it thoroughly, getting all the gelatin dissolved into the mixture. Two minutes should do the trick. Do not stint on the whisking! Strain the sauce pan of cream into a small pitcher, catching any bits of undissolved gelatin. Now you are going to pour the cream mixture into your molds. Ramekins work well, as does a small pyrex baking dish. Of course if you have any old-fashioned jello molds, this is the time to use them. Once you've filled the molds, allow everything to cool down to room temperature, then refrigerate it for at least 4 hours or over night. During this time it will set up true and firm. You can certainly serve panna cotta straight up, but that would be avoiding the wonderful possibilities of working local fruit into the dessert. Raspberries, blackberries, strawberries, cherries and peaches all work well as a sauce. While you can just spoon on cut up berries, marinated in something good, you can easily take it a step further by making a coulis. A coulis is a processed and strained fruit sauce that incorporates a little sugar and perhaps a complimentary alcohol. Simply dissolve some sugar into a bit of water, over low heat; add in the cut up fruit; process it until you have a smooth purée, then strain it into a sauce pan. Add any additional flavorings you want, and you're all set. Using the coulis, which should be thick, you could pour some into the bottom of your mold so that it will form a top layer later or. Or you can just pour it over the panna cotta, and garnish with a few pieces of whole fruit. And, if you want to really ambitious, you can add the fruit flavoring early on by putting it back in the original gelatin and cream blend. Just process it enough to get a thorough blend. Another popular technique is to add a little bergemot-flavored Earl Gray tea to the cream. Or you could try coffee, or a liqueur of some sort. The only caveat is to use a light hand and don't overwhelm what should be a delicate, ultra-smooth dessert.